Laurel W. Rice is chair of the Department of Obstetrics and Gynecology and a professor in the Division of Gynecologic Oncology at the University of Wisconsin-Madison School of Medicine and Public Health. Dr. Rice attended college and medical school at the University of Colorado. She completed her residency in Obstetrics and Gynecology, as well as a Fellowship in Gynecologic Oncology, at the Brigham and Women’s Hospital, an affiliate of Harvard Medical School in Boston, MA. After four years on the faculty of Massachusetts General Hospital, the University of Virginia (UVA) recruited her to the Department of Obstetrics and Gynecology. 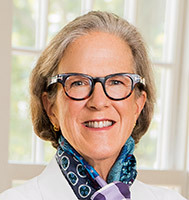 During her 14 years at UVA, Dr. Rice was appointed Division Chief of Gynecologic Oncology, established a Fellowship in Gynecologic Oncology, and served as Vice Chair of the Department of Obstetrics and Gynecology. Nationally recognized as an expert in the care of women with gynecologic malignancies, Dr. Rice has published extensively in her field. Her research focuses on hormones and human malignancies, specifically endometrial carcinoma. She has lectured extensively throughout the United States. Dr. Rice continues to serve in leadership positions of many national organizations. She is currently President of the Society of Gynecologic Oncology, Past President of the Council of University Chairs of Obstetrics and Gynecology, President Elect of the American Gynecological & Obstetrical Society, and an active member of several other professional organizations. Since 2006, Dr. Rice has served on the American Board of Obstetrics and Gynecology and currently serves as a Representative on the Board of Directors. She is an examiner for candidates seeking board certification in both General Obstetrics and Gynecology, in addition to the subspecialty area of Gynecologic Oncology. She also serves as Associate Editor of Gynecologic Oncology, and as a reviewer for Obstetrics and Gynecology and the American Journal of Obstetrics and Gynecology, both highly regarded journals in her field.